With further information encrypted in a code that Hashida can’t decifer, Rintarō learns from John Titor that he needs the IBN 5100 computer Moeka was looking for to decode it. Whilst doing his laundry, Rintarō runs into Kurisu, who is still in denial about a time machine existing. 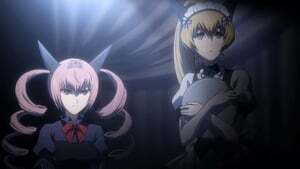 After Mayuri hears from her co-worker, Feiris Nyannyan, that she knows about the IBN-5100, Rintarō plays a game before learning that the computer is at the shrine where Ruka works. After getting permission to borrow it from Ruka’s father, Rintarō and Kurisu carry it back to the lab.